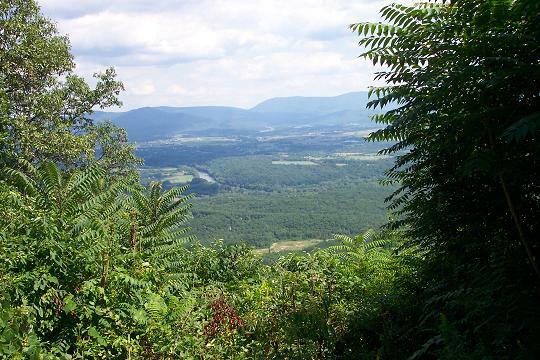 Description: If you are a “Sweeping View” kind of hiker and you find yourself with a free clear weather day this one is for you. 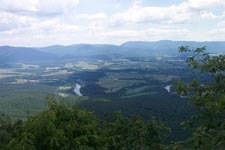 This is a moderate 8.5 mile (9.0 if starting from Camp Roosevelt) circuit hike on Massanutten Mountain. 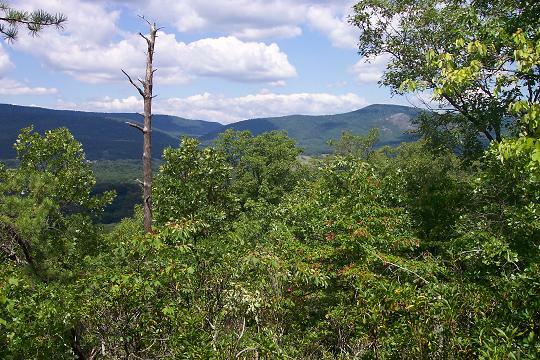 There are views as you both ascend and descend the ridge as well as at the focal point of the hike, Kennedy Peak. 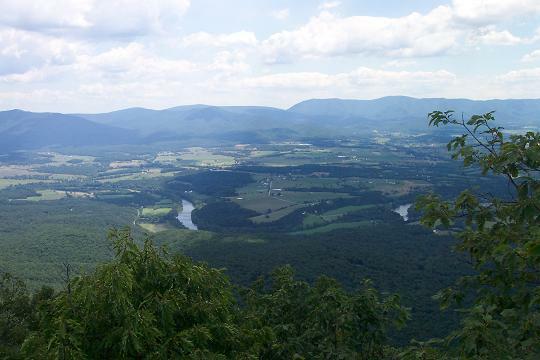 From there you get an unobstructed view of the Shenandoah Valley and Blue Ridge Mountains to the east. On a clear day you can almost see Front Royal to the north. The trail is well maintained although pretty rocky in places. 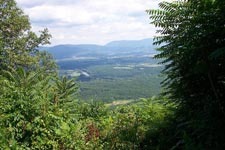 The main difficulties are the 1100 foot elevation gain over 2.5 miles as you climb from the valley to the peak itself. Trailhead parking is up a signed gravel road. To start the hike at Camp Roosevelt (Flush Toilets!!!) proceed a little further down RT675 and turn right and then right again to the picnic parking area. Note: The last turn off of U.S. 211 is signed Crismon Hollow Road. This road is often closed in the winter. Trail Notes: Starting from the restrooms in the picnic area, follow a footpath out to RT675. Turn left (uphill). Pass the dump station and Massanutten southbound trailhead on the right. Turn left onto the gravel road. Pass the orange blazed Massanutten Trail on the right (your return route). Walk through the large gravel parking lot and find the trailhead for yellow blazed Stephen’s Trail. Stephen’s Trail parallels the ridge, climbing up and down gentle hills and in and out of small coves. 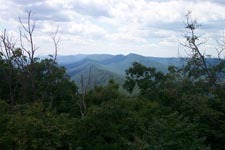 Just before you begin a steep climb through a series of switchbacks you will obtain a view of the western ridge to the left. 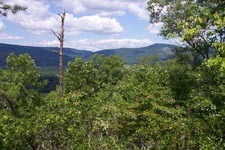 At 4.21 miles from the trailhead reach the intersection of orange blazed Massanutten Trail. Turn right here. At 0.81 miles from the Last trail intersection arrive at white blazed Kennedy Peak Trail. Climb steeply for 0.23 miles up a rocky trail to the ruins of an old fire tower. 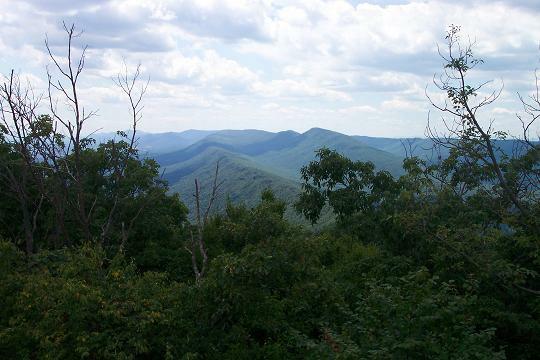 Climb to the top for a great view of the surrounding valley and the Blue Ridge to the East. The gap in the mountains directly in front of you is the Jeremy’s Run drainage in the SNP. Return to the Massanutten Trail and turn left. 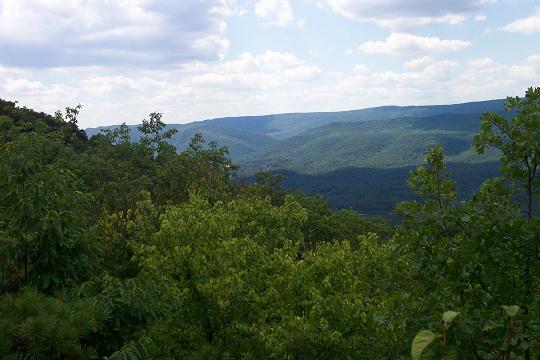 There are more partial views of Fort Valley and the western ridge along the higher part of this segment. 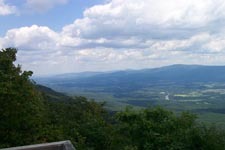 In 2.23 miles reach RT675 at Edith Gap and a final view of the valley. 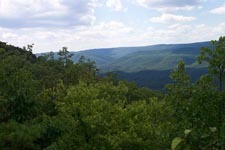 Turn right and walk downhill a few yards where you will re-enter the woods on the continuation of Massanutten Trail. In about 0.78 miles arrive back at the gravel parking area. Retrace your steps to the picnic area. 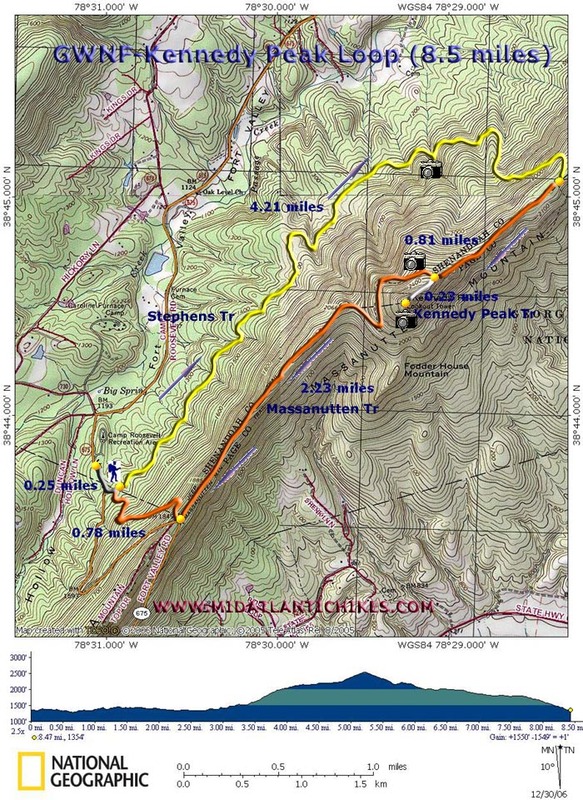 Critique: Awesome hike. Went by myself to watch the sunset, it was beautiful. Nice steady climb with a pleasant grade, and great leg burner on the last "leg" up to the peak. I enjoyed solitude on the mountain as no one else was on it, great part of hiking in GWNF. Nice partial views on the way up but the boom at the top .. sweeping vista all around, it was powerful.